Case B12: Junctional Rhythmn with Right Bundle Branch Block. St Emlyn’s ECG Library. 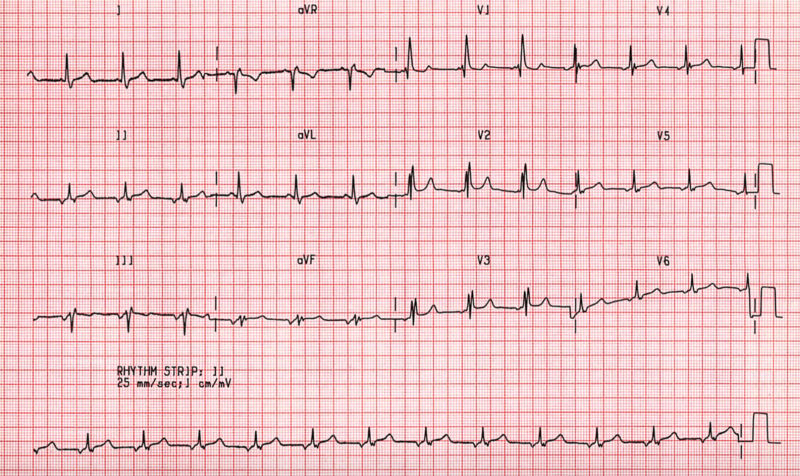 The ECG was recorded from a 61 year old man with a history of angina and chronic obstructive airways disease. Rhythm: There are regular P waves occurring shortly before each QRS complex. The P waves are inverted in lead II, III and aVF where they would normally be expected to be upright This suggests that atrial activation is occurring in the opposite direction to that in sinus rhythm. Morphology: The QRS complex width is greater than .10 seconds and is associated with a secondary R’ wave in lead VI. Right bundle branch block (RBBB) is present. This rhythm was formerly called coronary sinus rhythm because it was thought that the pacemaker was likely to be situated in the AV node near the opening of the coronar)’ sinus. The exact site cannot be determined from the surface ECG and the appearances depend on a marked delay in anterograde compared with retrograde conduction. The right bundle branch block seen here provides additional evidence of problems with anterograde conduction.